Generally-speaking, the game of tarot was not widely accepted in England until the 1870s when a number of English occultists had begun taking an interest in the tarot, such as Samuel L. MacGregor Mathers (1854-1918), Arthur Edward Waite (1857–1942) and Aleister Crowley (1875-1947). 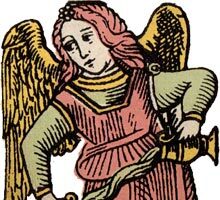 Cartomantic tarots commenced being produced in the early 20th century and since then there has been a distinguished output of English Tarot Cards. Leading up to this, the eighteenth century had brought a revival of interest in the older tradition and antiquarianism became fashionable. There was an intense curiosity about the glories of the past, a time of rediscovery and of much vague theorizing mingled with scholarship. From about 1850 England saw the rise of a growing interest in spiritualism, including interest in séances, connecting with the dead, the occult, etc. Madame Helena P. Blavatsky (1831-1891) founded the Theosophical Society which connected with Eastern mysticism, and a line of successors introduced Eastern spirituality to the West. These included Annie Besant (1847-1933), J. Krishnamurti (1895–1986), G.I. Gurdjieff (1866-1949), P.D. Ouspensky (1878-1947), etc., as well as Maharishi Mahesh Yogi's Transcendental Meditation in the 1960s, the hippie movement, Sri Prabhupada's Hare Krishna movement and so forth. Today the range of New Age or alternative therapies available includes Tarot readings, Chakra realignment and cleansing, crystals, massage etc to a myriad of other options. Virtually anything can be found. Back in Victorian England, MacGregor Mathers, leader of the Hermetic Order of the Golden Dawn, was the author of a popular booklet on the tarot, in which he wrote that "the Tarot, consisting as it does, of the ten numbers of the decimal scale counterchanged with the tetrad, and of a hieroglyphical alphabet of twenty-two mystic symbols, must be relegated to a far earlier period in the history of the world than that usually assigned to the introduction of cards into Europe". Mathers was no doubt aware of the new ideas originating from the East, and also offered theories on the Egyptian origins of the Tarot, and threw in some extra ideas about Gnosticism and Cabbalism. who communicates in the measure that they can receive her influx." The Rider-Waite Tarot was designed by A.E. Waite and Pamela Colman Smith, and it expresses the artist's sense of mysticism, ritual, imagination, fantasy and emotional experience within the context of Waite's astrological and alchemical symbolism. a happy home life full of joy and contentment is possible with a bit of good management, especially in marriage. If upside down, then start worrying! in which seers throughout the ages have recorded their knowledge", and then gives instructions on consulting the cards in 'the gypsy way'. Examination of the pack reveals that some of the symbolical motifs reappear in Fournier's "El Gran Tarot Esoterico" (1978). There have been several editions of this pack published since 1972 and it has become one of the more popular 20th century tarot packs. The original paintings were made with wartime materials, and are currently housed in the Warburg Institute, London, where they are beginning to show signs of deterioration. 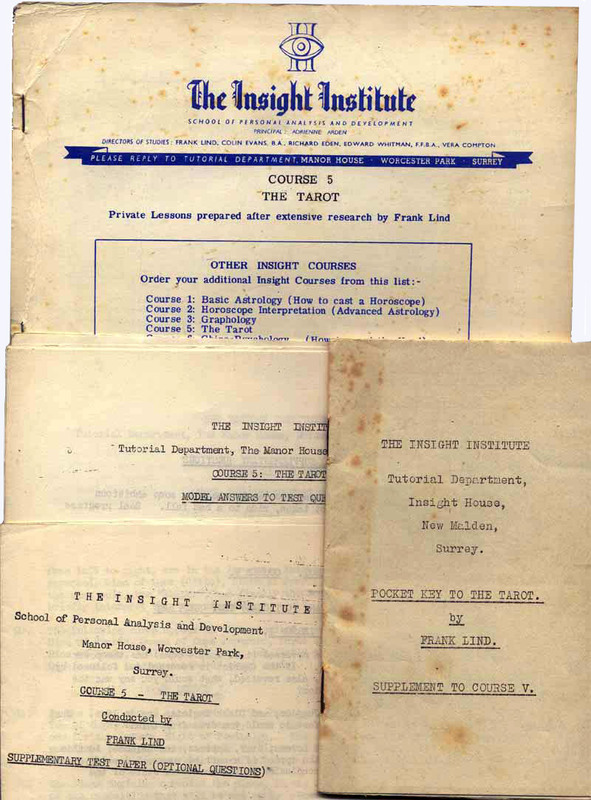 Above: The letterhead from the Insight Institute, dated 1949. The letter accompanies the pack of tarot cards, plus lessons, and acknowledges receipt of £2. During the late 1940s and 1950s The Insight Institute, of New Malden in Surrey, ran correspondence courses on the Tarot, which consisted of lessons with homework which was checked by tutors. The principal of the Institute was Adrienne Arden, and the "Directors of Studies" were Richard Eden, Noel Jaquin, Colin Evans, Edward Whitman, Vera Crompton and Frank Lind, who subsequently published the correspondence course material under his own name. he Insight Institute also published courses on Astrology, Graphology, Chiro-Psychology, Yoga and Psychic development, as well as a set of 'Authenticated' Tarot cards. The Insight Institute Tarot course describes the origins of the Tarot as 'Indian', introduced by gypsies who spoke Romany, which accounts for the problemmatic origin of the word 'tarot', (according to the Insight Institute). 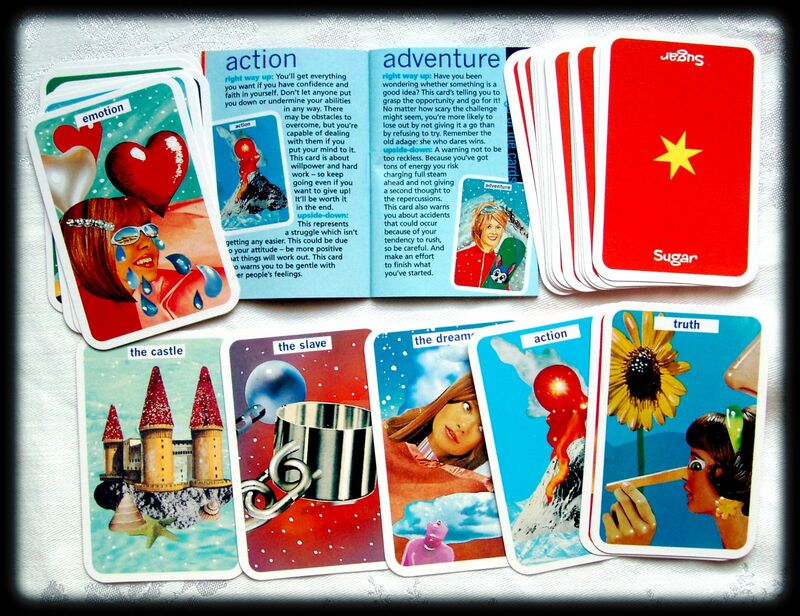 The Rolla Nordic Tarot was first published in 1960 during the hippie tarot revival and was inspired by the Insight Institute’s tarot study course. 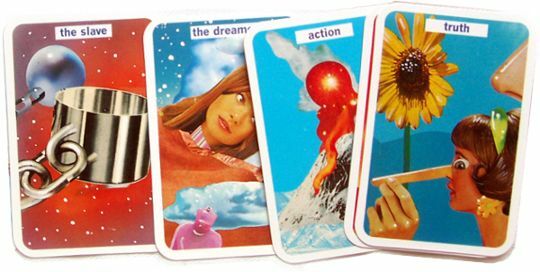 During the 1970s Waddingtons distributed tarot packs in England, often in conjunction with Stuart Kaplan, such as the 1JJ Tarot deck manufactured by A.G. Müller + Cie, Switzerland in 1970. Stuart Kaplan also commenced publishing 'complete and authoritative guides' on the tarot, as well as re-publishing the Rider-Waite Tarot (see above) which has now become a classic. Cards illustrated above: Number 11: OOps!, maybe your zits will clear up/Someone you know secretly likes your boyfriend. Number 1: You'll be going to a party/you have great artistic ability. Number 5: Someone will be reading your diary or listening in on your phonecalls. all you need to predict your destiny. An explanatory booklet contains an introductory welcome from "Atlanta", shown holding a crystal ball, instructions on how to do readings, interpretations, different spreads, etc. It was printed by the West Yorkshire Printing Company Limited. The Psychic Companions, formerly The Psychic Friends Network and based in Lancashire, runs a phone-a-psychic service using either tarot, runes or numerology. 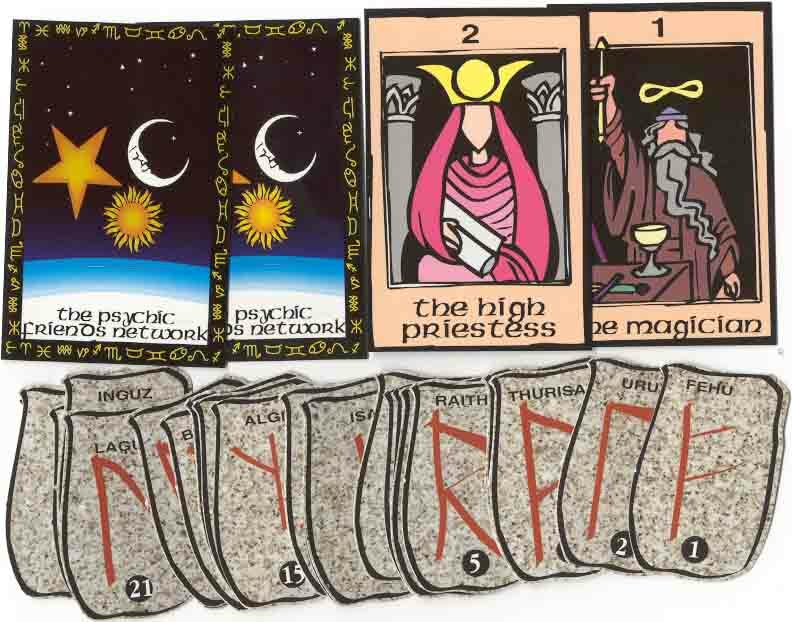 A set of tarot cards and runes is available, along with a quarterly magazine covering a variety of psychic topics, workshops, prize draws and classified ads. The customer pays for readings at the rate of £1 per minute. There are a total of 26 cards in the pack: 22 Major Arcana plus the four aces of the tarot deck. Each card is clearly numbered at the top, in Helvetica typeface, and inscribed along the bottom in a half-uncial style of calligraphy, so that the data can be given to the psychic over the telephone. The leaflet accompanying the cards describes the tarot as "one of the most important forms of western mysticism". Cards illustrated: The Fool, The Moon, The Wheel of Fortune and The World. Russell Grant's Astrology Club Tarot was published in 1999 in connection with Russell's live telephone readings service see more →.